Before I met Forever Living , my skin was very problematic. I got pigmentation, burns and allergies. I tried many kinds of skin care even the expensive imported ones from Europe and USA. My Dermatologist advised me to use sunscreen and must be careful with skin care. My skin was prone to spots or pigmentation even I am naturally tan. Working always under the sun is quite challenging. I was always in the sunny day almost all year round was tough for me. Many of our daily activities were under the sun. There were years in my early 40's pigmentation starts and was very disappointing. I am so impressed with Forever Living Products, especially this aloe fleur de jouvence. This product helped to repair my damaged skin (pigmentation and wrinkles). Now, I am in my 50's, slowly I gain appreciation from friends and people who knows me. Since I use regularly aloe vera skin care of FLP. after a while I started regularly using Forever Living Skin care products. Of course when I say good nutrition, I changed mostly of my eating habits and lifestyle . I pamper my skin with aloe fleur de jouvence, this extra ordinary skin care have been helping me to regulate my skin tone, to help delay wrinkles, and to have my instant face lift at the comfort of my own place. Some years ago from a difficult job condition plus the damage of chemical based cosmetics, and sun damaged to my face was tremendously disappointing. It took me at least 3 years to switch from different products recommended even by aesthetic personnel, it did not really had the best result. It was also very expensive for maintenance to be back and fort to their clinic. One day, I decided to use aloe fleur de jouvence plus other flp skin care products. I've been patient to see results , it was not immediate. It took a while, then I see the real results with all patience to take care of my skin with Forever Living skin care products. I finally made up my mind to stick to flp skin care. After some months and a year at least! Many family members noticed the big improvement. I look younger and look better! Thanks to Forever Living SKIN Care Product Lines... LOVE it. Forever Epiblanc helped my skin to reduced the brown spots and pigmentation. It was the most difficult thing in the face to remove. With the help of Forever Epiblanc my problems with spots is over. 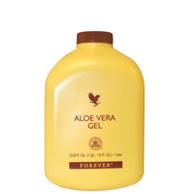 Aloe Liquid soap of Forever Living is one of the most important personal care in the family. I used this since my children where babies, now they are adults, they still love it for their daily skin care. 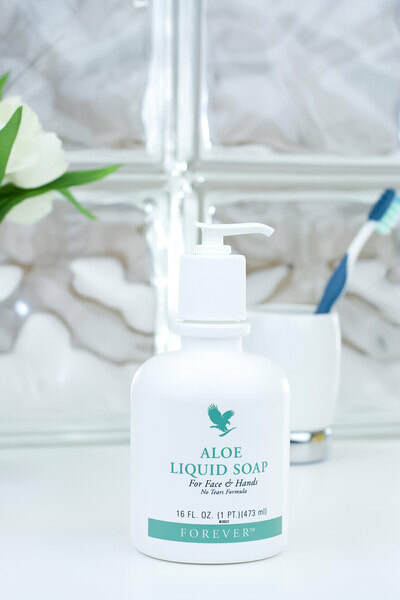 This versatile aloe liquid soap is so mild and it cleans without drying my face even in my important parts of my body, so clean and soothingly fresh. This Ph balance liquid soap is amazing with the skin even for babies , infant , toddlers and adults alike. It is very economical too. Aloe Moisturizing Lotion. This is very rich moisturizer ideal for face and body. I use this for my legs, hands, feet, toes, elbows( parts of the body that easily get dry ) and in the winter , I use this moisturing lotion before make up ( only when I run out of my aloe fleur de jouvence , I use this especially on winter time). aloe Moisturizing lotion has a very special effect in the skin if you use it regularly, it makes your hands and feet soft and look young.During auatomn, spring and winter, I love to pamper my skin with aloe moisturizing lotion after shower. It leaves the skin soft , clean and I am confident because it nourish my skin not only in the surface , it works in the cell of my skin. This lotion lighthen my skin scar in my belly caused by operation,and stretch marks, even the 20 years old scar is not visible anymore, by constant use of aloe moisturizing lotion , it gives me confidence everyday about my skin. Aloe Healt Lotion -This lotion eases my tired muscles of hard work or exercise. I use this for body massage. Non steaky, I dont need to take a shower after massage . This rich emollient formula is perfect companion for active people like me. Whenever I feel tired and want to ease the pain in my muscle, I use aloe heat lotion. So relaxing,refreshing especially on bedtime. My whole family loves this product. Anyone in the family when feeling weak or sick , to give some massage in the feet or in the arms, or in the back, terrific results. It helps a lot to feel better. 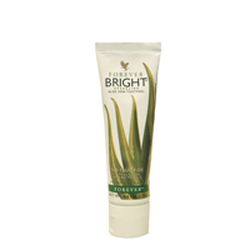 Forever Bright toothgel is so versatile and very effective in preventing my gums from any discomfort. It maintains my pearly white teeth good, and leaves my breath fresh all day long. No bad-breath when waking up in the morning. I always bring with me this toothgel even travelling for any emergency for teetth and gum care. Aloe Vera Gelly- versatile skin care. This is my first aid lotion that I always bring with me when I travel and have it always as one of my skin care collection. This lotion that soothes & conditions skin penetrates up to the 3rd layer skin like all other skin care products of FLP.... This translucent gel containts humectants & moisturizer that eases well the skin problems, from burn, itchiness even boils in the skin . this serves an all purpose lotion for me. When itcheness or burn occur in the skin , this is my first aid. aloe propolis creme. 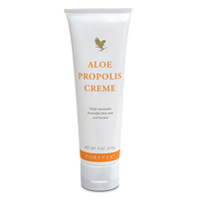 I never missed to have aloe propolis creme in my personal care, either when I travel or at home, I always have it. This versatile skin conditioner and mositurizer. Several years I've known this product since in the 90's. It gives me relief in many skin problems like too much stress,sun exposure, skin boils and many other. My daughter and my son loves this product one of their skin care collections. Aloe bath gelée is one of the product I liked most when I take my shower or full bath. I mixed amount of it with water and it cleans, smooth en my skin. I felt it after my shower that sometimes in the warm season, I don't need a lotion when I use this in my shower. It leaves my skin so smooth, light and so clean and fresh. It clears away the dead skin so easily. 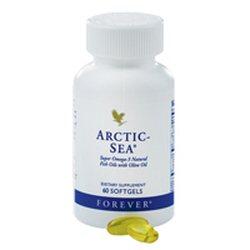 I use this also before toning or using the aloe toner for helping my body in shape or trim my waist line. Aloe Bath gelée gives me so much confidence about my skin and my body. It regulates my skin and keeps it tight and smooth. It removes dead skin cells in the skin . Its worth the price, very economical for me. A little drop to my loofah and moist it with water, then it lathers and cleans, regular use of aloe bath gelée makes the skin younger, smooth and lighter..
Only aloe bath gelée fits my skin for many years, I tried other products, nothing suits my skin, it is the only product I found so comfortable to use in cleaning , removing dead skin cells in mild way. With the help of loofah, this works so good. Wonderful skin care product!!!! Aloe vera gel is my favorite supplement. I take it everyday, after I had induced menopause last 2009. Aloe vera gel is my overall complete vitamins . I take at least 2 ounces every morning before I start my day, this helps me to have balance digestive function and gives me nutrients that I can't get from my daily intake of food. I consider this as my first favorite product. It gives me the complete vitality that I need for the whole working day. Pomesteen is my favourite antioxidant fruit drink. I love to blend fruits. 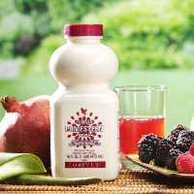 With forever Pomesteen, I am assured to have all my daily antioxidant fruit drink. this drink is very potent . One day I got colds and flue, I had no appetite and so weak, I consume a bottle of pomesteen of FLP , after an hour it gave me strength and energy. Forever Absorbent C, is one of the first product of FLP after the aloe vera gel that I always have. We always have this at home. In travelling, It is one on my list in important things to bring. Absorbent-C helps maintain healthy connective tissues, skin, joints and respiratory functions. Vitamin C is water soluble, and is secreted from the body. Since humans are among the few animals that are unable to make their own vitamin C, we must therefore get it from our food, drinks, and supplements, such as Forever® Absorbent-C®. 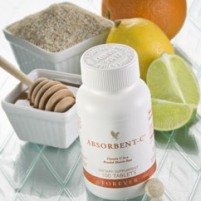 Absorbent-C with Oat Bran is an outstanding nutritional supplement. It combines two vital nutrients into one convenient product. The bonded matrix composition is a unique delivery system combining 500mg of oat bran with the full 60mg of vitamin C in each tablet. I liked this odorless softgel. 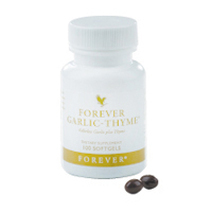 Garlic thyme is one of my favourite nutrition supplement. Garlic helps my metabolism converts my fats to energy and protect my body against free radicals. Garlic has multi protection to our health. research shows that sulfurous compounds from garlic can be used in the production of hydrogen sulfide gas within the body, which appears to expand blood vessels and keep them relaxed, thereby helping manage blood pressure. Garlic has also been shown to lower cholesterol and triglyceride levels. Garlic's collection of powerful phytonutrients have anti-oxidative and anti-inflammatory effects on the blood vessels and blood cells. A particular compound called ajoene exhibits anti-clotting properties. Studies have found an inverse relationship between garlic intake and rates of cancer. The sulfurous compounds in garlic have been shown to inhibit the growth of cancer cells in culture, as well as induce apoptosis (cell death) and prevent blood vessel formation within cancer cells. Although not present in large amounts, garlic also contains several nutrients known to have an anti-oxidative role within the body: Vitamin C, manganese, and selenium. Researchers in India looked at the effect of adding raw or cooked garlic and onion to the cereal grains and pulses considered staples in the local cuisine, and found that both the raw and cooked forms of garlic and onion improve the bioavailability of iron and zinc. lower my bad cholesterol. Its the fish oil prescribed and recommended by one of the doctor in my country for those who have cardiovascular disease and cholesterol problems. I found out, this products helps the brain function. Remember that our brain is made of fats. The good fats from fish ( cold pressed fish oil ) , and virgin olive oil.. Check more details about this product by clicking the photo. These are the products we don't miss at home. Forever Bee Honey - I take one tablespoon at least 3 to 4X/week, Royal Jelly, I take at least everyday if I don't miss it. Its also good to take to relieve headache and fatigue. Forever Bee Propolis - I take only when I feel so week like when I work overtime , and in the cases when I had medical problems like to recover fast in my surgery. this Forever Bee Propolis prevents me from any infectionins to occur inside the body. Bee Pollen, my daughter loves this product during her weight control program. carpet cleaning, and for hand-washing dishes. This safe, concentrated, liquid detergent is great for lifting grime, cutting through grease and removing stains without scratching or marking any surfaces. It is versatile enough to do the job of many similar products on the market, with a major cost savings for the user. The statements contain here in have not been evaluated by the FDA .The Products discussed are not intended to diagnose, mitigate , treat , cure or prevent a specific disease or type of diseases. Your should consult your family physician if you are experiencing a medical problem.